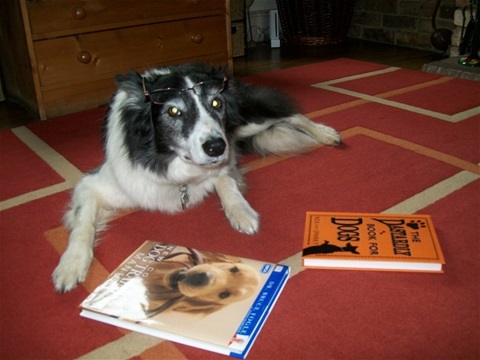 My name is Murphy as I'm sure you might know, I'm the handsome Collie that keeps cropping up on nearly all of the pages on the website. Not the cartoon ones obviously though I can see the resemblance between myself and the collie that's jumping in the air with a lead. So I've been appointed the head author for this blog, it's just a part time position at the moment but it pays well (in treats). Anyway that means that I have to write about all the latest news and information so I suppose the first thing I had better do is congratulate the graduates of the latest Advanced class, they did really well and their dogs are really clever. I'm fond of one dog in particular, I think it's because he reminds me of myself, so enthusiastic and springing around everywhere. Of course I've never actually met him but I recognise him by smell when Kiri comes home, though I have got to say whenever she come back from a class, she stinks! I just can't stop sniffing because I can smell different dogs.